What kind of dinner party do you like to throw? What is your ideal number of guests? Do you have a few go-to dinner party dishes? I like a big, casual potluck, myself. (Or a casual dinner for a few close friends. Notice the theme here? Casual.) We don’t throw nearly enough big parties these days, but I’d like to change that. The beauty of a summer potluck is the ease: clear off the counters, park a big bucket of ice or a keg in the back yard, ask a few neighbors to contribute lawn chairs. I’m ready. All we need now are some warm, sunny evenings. I’m happy to announce that I’m gearing up for my real-life party plans by attending a Virtual Vegan Potluck this Saturday. Tune in for my contribution (we’ll be rolling brown rice sushi, speaking of fun dinner party ideas), then hop around the table to see what else is cooking. I can promise that we will all come away with enough recipe inspiration to get us through a summer’s worth of potlucks. As it happens, a cold soba noodle salad is one of the dishes I like to take to potlucks now and then. It’s easy to make, you can toss in whatever veggies you have handy, and the pasta easily stretches it to feed a crowd. Maybe you toss in some tofu, maybe not. I haven’t had a go-to dressing for my salad, though; sometimes I just did rice vinegar and sesame oil, other times a so-so peanut sauce. That all changed this week. I love An Unrefined Vegan’s spicy almond sauce, and I hereby declare it the dressing that shall adorn my soba salads all summer long. It was great to start with, but I doubled the almond butter and the spice because I am decadent like that, and the resulting dressing is even more creamy, spicy, and rich. You won’t be sorry if you invite me to your potluck this summer. Feel free to request this dish; I’ll be making it a lot, it keeps and travels well, and it’s as good cold as it is warm. 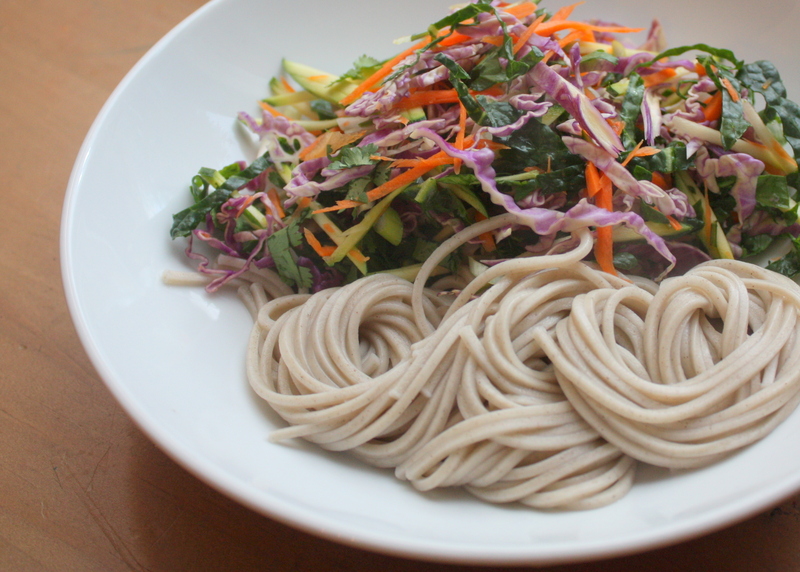 Buckwheat Soba Salad with Spicy Almond Sauce: In a blender or food processor, whizz 1/2 c. almond butter, 1 Tb. miso, 1/4 c. vegetable broth or water, 1/4 c. rice vinegar, 1/2 tsp. chile garlic sauce, juice of 1 small lime, 2 Tbsp. soy sauce, 2 tsp. honey, 1 Tb. grated ginger and 3 Tb. crushed garlic. Taste and adjust to your liking. Finely shred a gorgeous pile of vegetables. I used purple savoy cabbage, red pepper, a couple carrots, a zucchini, a few leaves of kale, and a big handful each of cilantro and green onions. You use what you have. 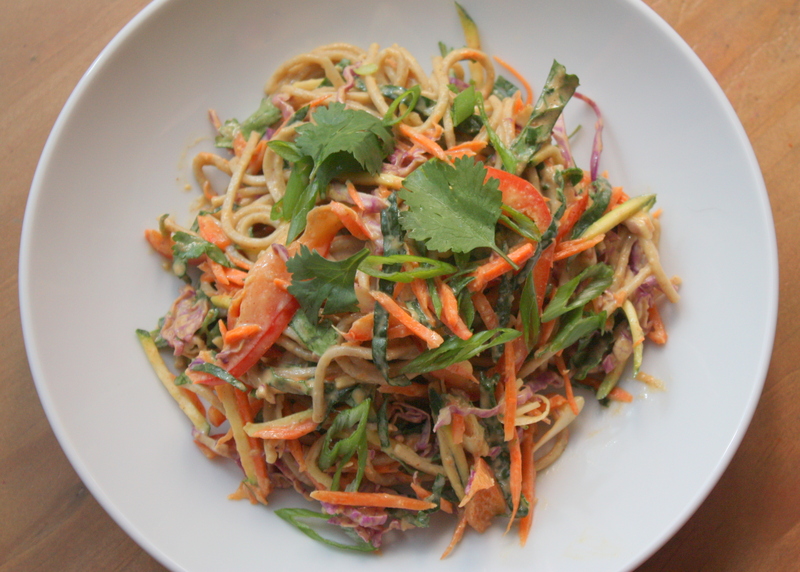 Toss shredded vegetables and almond sauce with cooked buckwheat soba noodles. Garnish with more cilantro and green onions. This entry was posted in Asian Flavors, My Favorite Recipes, Noodles, Vegan or Would-Be-Just-As-Good-Vegan and tagged cooking, dinner, DIY, family, food, healthy, homemade, lifestyle, pasta, recipes, salad, vegan, vegetarian, whole grain on May 10, 2012 by emmycooks. As usual, this sounds and looks amazing! I’m throwing a big get-together for my cousins in June, and one of the crowd is a vegan so I’m on the lookout for good recipes. Actually, this just looks good, period, vegan or not! Can I steal your photos ;-)?? Glad you were inspired – it’s such a satisfying combination! Thank you so much for the blog and the VVP mentions! Woohoo! This looks great! I like cold soba salads for potlucks too! I generally like to dress them with Heidi Swanson’s otsu (the first version), but it’s a little liquidy. A thicker sauce like the one you have would be perfect! Bookmarking for future picnics . . .
Yum. That sauce sounds grand. And the salad is so pretty. I had never heard of almond butter either, and now know that it is basically peanut butter with peanuts substituted by almonds. I doubt that it’s available here, but it sounds like something I may like as I love almonds. Perhaps I’ll bring a jar back from my next visit to the U.S. this September. If almond butter is available where I’ll be going (Utah, Montana, etc.) that is. As for what kind of dinner party I like to throw, there are two numbers of guests that I like: 4-6 or 12-16. I like a group of 4-6 diners because I can make any recipe I like and can go all out on making everything perfect in terms of taste. I usually make an Italian dinner (antipasto, primo, secondo, dessert). I like the atmosphere to be informal, but do notice that sometimes my guests find it hard to combine high-quality food and wine with a casual atmosphere. I get hungry when you take pictures. This looks great. I read that the term potluck is actually European in origin. In the middle ages you could opt for the “luck of the pot” which meant left overs apparently. I just got that from a quick search, but that might make an interesting post if someone were to look into it in more depth. Wow, that is a must try recipe! You know how to pick them! This was GREAT.